JANUARY 7TH, "AWAKE" Mini Retreat at Avenues Yoga. Join Mindfulness and Compassion Teacher, Becca Peters, on Sunday, January 7th, 2018 for a 2.5 hour mini-retreat. Becca will lovingly guide you in meditation and reflective mindfulness exercises to support you living life with greater self-compassion, authenticity and joy. The final hour will be led by Nikki Breedlove who will offer an hour of kundalini yoga to integrate body, mind and spirit. Please bring: a bottle for water, a yoga mat if you have one, a meditation cushion (if you do not have one there will be a select number available for your use), warm socks and a light blanket. Light gluten-free, vegan snacks will be provided during the break. Please join us on Sunday, November 19th for a day-long meditation and yoga retreat to re-boot your Self-Love practice and to remember how it feels to slow down, set aside the worldly to-do list, and to rest in self-care. Our day together will be held in the stillness and splendor of Red Butte Gardens where nature reminds us of the changing seasons and the beauty of simply being present to witness our own transitions + natural rhythms, together, in community. I will guide you through an afternoon of reflection, weaving together meditation and experiential mindfulness practices to support your health and wellness. I am so excited to share with you my own daily practices that have supported me over the years to treat myself with compassion and finding peace and ease in the journey. My beautiful friend, Nikki Breedlove, will guide you in an extended yoga practice that is suitable for all levels of practice. Nikki’s approach to yoga is gentle, wise and through a sequence of breath and asana practices she guides you back to yourself, to the natural rhythm of your life. Cost: $100 per person due at the time of registration. **No refunds will be given for cancellations after November 12th. You, yourself, just as you are. Nothing fancy, just your authentic + beautiful self. **The SHOPPE at Metta Mindfulness will have items available for purchase from 9 - 9:30am onsite to include meditation cushions, journals, malas, books, essential oils and more. Retreat Cost of $200 is due upon registering. A meditation cushion will be supplied. If you have need for a chair please email Becca your specific needs. Participants will need to bring their own yoga mat. Attendee checkin is at 8:30 am. High quality, eco yoga mats are available for purchase at Metta Mindfulness + Meditation Center. A 10% discount will be applied for all retreat attendees. 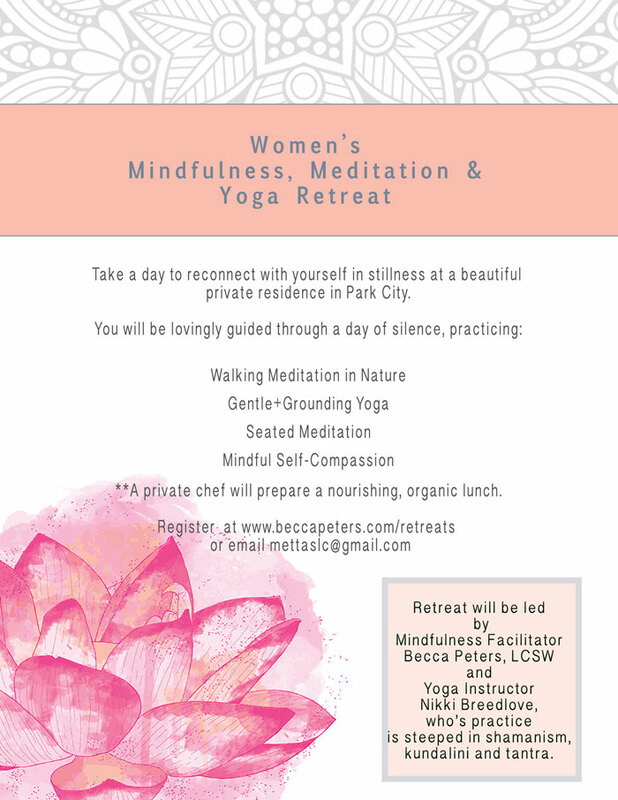 BECCA PETERS is the owner and creative mind behind Metta Mindfulness + Meditation Center in Salt Lake City, Utah. She is also a therapist in private practice as well as an educator and consultant for public and private organizations. She teaches Mindfulness for UCLA, Compassion Cultivation Training for Stanford, Mindful Self-Compassion for The Center for Mindful Self-Compassion as well as a mentor for students in UCLA's TMF program. She is a passionate human being who cares deeply and dedicates her life to sharing tools for healing, health & happiness. NIKKI BREEDLOVE answered the call to be a teacher through a dedicated yoga practice, multi-disciplinary yogic study, and a near-death experience. Through this path she has come to realize and embody the immense hope and love that is very much alive in her. After recovering from a traumatic accident, which left her in a coma for a period of time, Nikki was given a gift from Spirit. Nikki has committed her life to sharing a positive message of health and overcoming the odds. She teaches a style of yoga learned in the Andes Mountains of Ecuador steeped in shamanism, kundalini and tantra. The rich sequence leaves you feeling refreshed, balanced, toned and strengthened. Nikki’s mantra is: We are spiritual beings with infinite possibilities! In love and Light.